Today for lunch we had Roasted Tofu with garden vegetables and rice. The original recipe was for Roasted Tofu with Leeks and Fermented Black Bean Sauce, but it’s raining out and I didn’t feel like venturing out into the wetness to harvest leeks from the garden. Instead I subbed in large scallions that I had on hand – they’re both onions, right? Yesterday I harvested some eggplants, so I also roasted them with some olive oil and sea salt, figuring I’d throw them into the mix too. I threw some oil into the wok, stir fried baby carrots (WAAAAAAY easier than peeling and slicing whole grown-up carrots), garlic, FERMENTED BLACK BEANS – Who’d ever heard of such a thing?? Found them at the Asian mega-market that’s on my trip home from work. The original website recommended a certain brand, so that’s what I bought. For $1.69 I’m a sport. So I threw all the veg into the wok, added the mashed beans, stirred it together, added a splash of fish sauce, then at the end I added a cornstarch slurry. The recipe called for Arrowroot – but who has arrowroot? Not me. Not yet, anyway…. I googled Arrowroot and lots recipe websites say you can use them pretty interchangeably, except for dairy stuff. Huh. When do you need thickeners for dairy things? Custards?? Puddings?? So I stir fried a bunch of stuff, added in the roasted tofu and served it over rice that happily cooked away in my rice cooker – one of the BEST inventions EVER. It was pretty good. Not great, but good. I’m DEFINITELY making the roasted tofu again. R couldn’t get enough of it! For dinner tonight I made Fresh Bread, and Roasted Chicken with Cauliflower and Chickpeas to be served over Fresh Pasta (recipe from the America’s Test Kitchen cookbook). 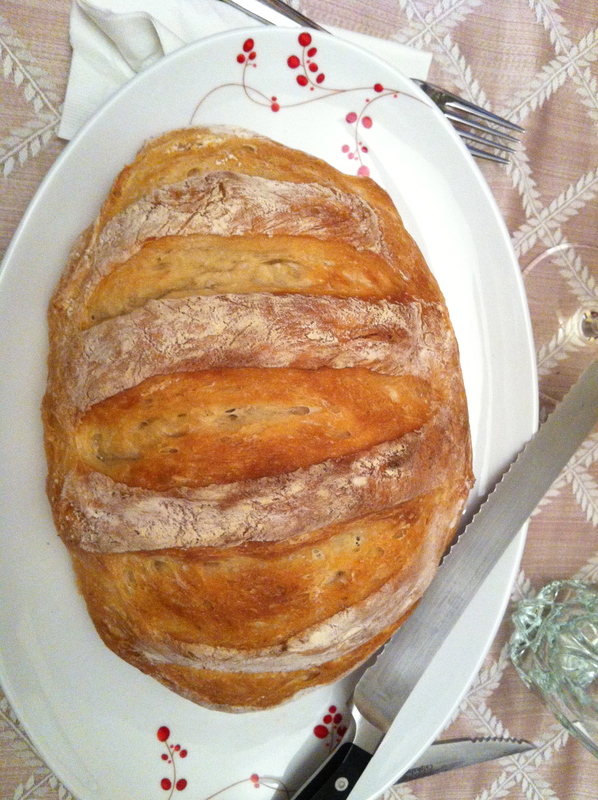 Warm Bread – could there be any food more perfect? Making the pasta was a family affair with my Mom, MIL, & step-daughter all pitching in. It was an all-hands-on-deck sorta situation, as it usually is when one’s making pasta by hand. THANK GOODNESS the results are worth it. The stuff of legends. Okay, not legends… maybe a memorable meal. The pasta is a little hard to see in this photo. Apologies. The Kitchen-Aid Pasta Rollers were a birthday present from my folks. MUCH happy dancing in this household. Arrowroot dissolved in water **I used cornstarch instead. 2- In a bowl, combine the oil, salt and paprika. Cut the tofu into cubes and gently toss to coat with the mixture. Place each tofu cube in a single layer on a baking sheet lined with parchment. Roast for 15 minutes on each side. 3- Heat a wok to hot, add the oil. Swirl the oil to coat the wok. When the oil is hot, add the garlic and black beans. Stir-fry for a few seconds, then add the leeks. Stir-fry for a few minutes, add the water and cook until the leeks are tender. 4- Slowly add the arrowroot/cornstarch mixture and stir to thicken the sauce to desired consistency. Add the tofu and mix well. 1- Water + Yeast + Salt in your big mixing bowl. 2- Dump in flour and mix – but DON’T knead. Let the wet dough sit for 2 hours, and up to 5 (Dough is easier to handle if chilled). 3- Dust your dough and fingers with just a little flour so you won’t stick. Yank or cut off a 1 pound hunk – about the size of a large grapefruit. Form the hunk into a ball and set it on a piece of parchment paper to rest – 40 minutes (up to 90 if you want more holes inside). 4- Oven to 450ºF with a Baking Stone on the center rack with a baking sheet on the bottom rack (at least 4″ away from the stone so it won’t crack the stone when you create steam). 5- VERY lightly dust the top of your loaf with some flour, then using a serrated knife, create slashes across the top (about 1/4″ deep). 6- Slide the dough- with parchment paper – onto your heated stone and then quickly pour 1 cup of hot water onto your baking sheet below your stone. Bake for 30-35 minutes, until the loaf is a golden brown color – if using the parchment paper pull it out after about 20 minutes so the bottom crisps too. 7- Let the loaf cool for about an hour before eating. You’ll be glad you waited! 1- Place a rimmed baking sheet in oven and preheat to 450ºF, with racks in upper and middle thirds. Season chicken with salt and pepper. 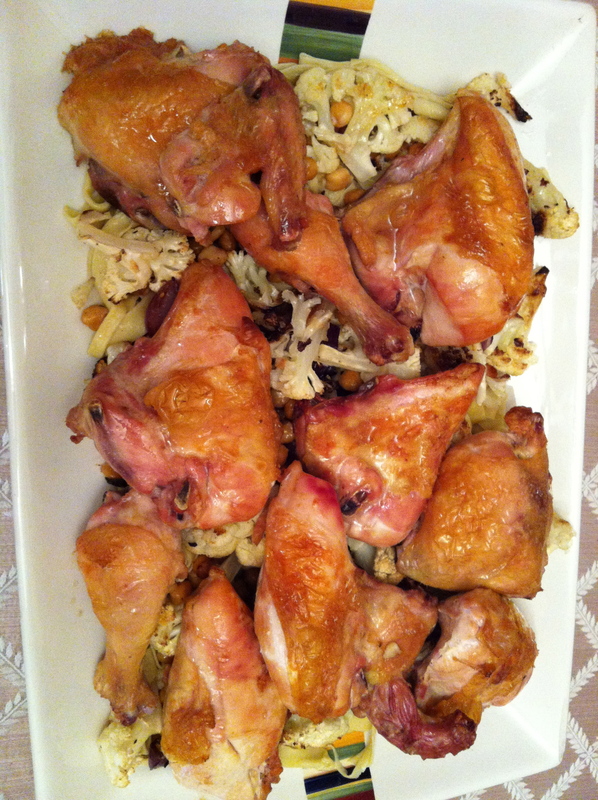 Carefully remove sheet from oven and arrange chicken, skin side up, in a single layer. Roast on upper rack, 20 minutes. 1- In food processor dump flour and a pinch of salt. Pulse to aerate. Add in eggs and let it whir until a rough dough forms (about 30 seconds). 2- If the dough looks like small pebbles, add water, 1/2 teaspoon at a time. If the dough sticks to the sides of the bowl, add flour, 1 Tablespoon at a time. 3- Turn the dough out onto a counter along with any small bits. Knead by hand until it is smooth (2-3 minutes). Either wrap in plastic or shove into a ziploc for about 30 minutes. You can leave it out on the counter for up to 2 hours, but if you’re not going to roll it out right away I would suggest you put it in the fridge. Just let it sit on the counter for 30 minutes or so to come back to room temperature before you roll that bad boy out. 4- Cut the dough into whatever shape you choose and then lay out on a flour-dusted baking sheet. Either hang to dry overnight or use right away. Fresh pasta cooks very fast – like under 4 minutes – so don’t wander too far once you’ve dumped it into the boiling water!